Sorry for being so slack in terms of updating my blog. The flipside is that I have so much to write about. So much has happened the last time I updated my blog: Start of school, Thanksgaving, My first Football game, Meeting the newbies, Speaking at the biggest Rotary Club in District 7080, Speaking at the District Conference, NHL game in Buffalo NY, CFL and MLB game in Toronto, Outbound Interviews....AND thats pretty much I can think of right now. So school has been going pretty well. I have only 3 courses this semester which means I have a spare period therefore, I go to school from 9am -2pm...everyday! Within the first few weeks of school, I was recruited to play for the school Football team and to be honest its been awesome. Im only punting and kicking, but Ive scored the 2nd most points for my team. Kicking a Football is actually alot harder than kicking a Rugby ball. Im now kicking around 45-50 yards a punt, and In practice I made a few 55 yard field goals, so that for now, is keeping me pretty busy. A great thing about being an "oldie" amoungst "newbies" is that youre looked upon for leadership, and this part im really enjoying right now. I was asked to speak on behalf of the Inbounds at the district conference. I think that my public speaking is getting better....compared to what it was like when I forst got to Canada! As well as speaking at the district conference I spoke at my larger host club which is also the largest in the District. I spoke about myself and New Zealand, and also spoke to convince people on hosting the next student coming to Guelph. Ive been experiencing alot of the major league sports that people in New Zealand dont really know alot about. My amazing host family took me into Toronto to see the Toronto Blue Jays play the Minnesota Twins. We had wicked seats- so close we could hear the players speaking! The atmosphere was awesome. A few week after I was given tickets to the Toronto Argo's game, which is the Toronto team that plays in the CFL (Canadian Football League). From Guelph, it takes no longer than 2 hours to get to Toronto and find the seats. My friend and I got so lost on the way home, that it was epic. It took 3 hours to get home!! So if you think getting into the US is easy...think again. About a month ago my host dad/counsellor and I went to an NHL game in Buffalo, NY state. Crossing the boarder is just as challenging as it is confusing. Everything aside, we got into Buffalo 5 minutes after the game had started, but I didnt miss the fight! Everyone gets on their feet and yells and chirps them! Hilarious! NB. Fighting is LEGAL in NHL hockey. Once again we had awesome seats. We were right next to the players' tunnel and 4 rows back from the bench; again so close to hear the players. About 10 minutes til full time and the puck from the ice gets flicked into the bench. It then got thrown over the screen to a teenage kid in the front row. To make a long stor short- I GOT THAT PUCK! It actually made my night. Ill try to be better with my blogging in the future. I go to Chicago soon with Blair's parents (Blair is the Outbound to New Zealand) so my next blog post will probably be about that. I think I leave the Thursday before US thnaksgiving at 8am and arrive at 5pm...looking forward to that 8 hour drive! 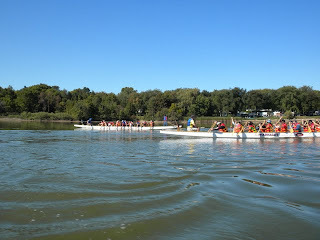 Our race- I was in the far boat, that won....! The NHL Game in Buffalo- how much closer can you be? ?